I bought my FinishPro 15 on Ebay. 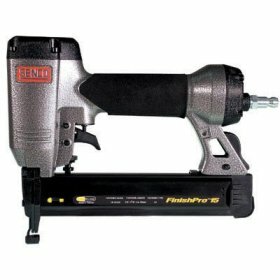 It was part of a three pack that included the Finish Pro 35 and SLS15 medium stapler. I've only shot 1-1/4" brads so far, but this thing works great. The load indicator is a nice touch. At 80psi the brads sunk right in the MDF I was working with. Ammo is cheap. 1000 brads were $3. At that price I should pick up a few different sizes so I have them when I need them. Won't fire when holding the trigger and pushing the tip on the work. The tip must be depressed on the work before pulling the trigger.